One-piece golf balls should be used strictly for practice. When golfers consider equipment, they generally think first about their clubs. Golf balls may have to compete with shoes, gloves, bags or even a golfer’s attire for second place on the equipment list. But players should also consider the characteristics of their golf balls, including their construction. As of 2012, golf balls contain from one to five layers. The one common piece on all balls is the cover. Each item beneath the cover counts as an additional piece. The most complex golf balls contain five pieces, including a core, plus three separate, inner layers. The cheapest and most basic golf ball, the one-piece model, is made of the same material inside and out. A one-piece ball made of surlyn, for example, is just one solid, rock-like surlyn sphere with a dimpled surface. This is the type of golf ball you will find at a mini-golf putting course. Much harder than a multiple-piece ball, the one-piece variety is sometimes found on driving ranges. It won’t travel as far as a multi-piece ball and really shouldn’t be used on the course. A two-piece ball often has a surlyn, although Bridgestone, for example, sells a urethane-covered, two-piece ball. Inside is a core that is generally made from rubber or a similar material. Many Callaway, Top-Flite and Titleist balls use polybutadiene – a synthetic rubber – as the inner material. When you’re choosing a golf ball, the two-piece variety is generally a safe bet for beginning golfers. All else being equal, two-piece balls roll farther and generate more distance than any other ball. 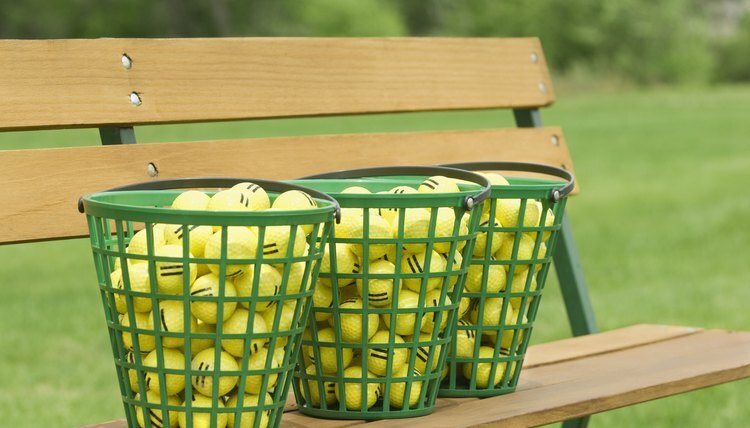 Balls with three or more pieces allow golfers greater control, which is why they’re typically used by better players who are good enough to fade or draw a shot on a dogleg hole or stop the ball on the green with their short irons. What Is Inside a Golf Ball?